The Employment Forum/Employment East held a celebration event on 21 March 2019 to thank participants and partners; and to mark the end of the two and a half year project. The project Chair, Hugh McCaughey (Chief Executive, South Eastern Health Trust) thanked all the supporting partners and outlined the achievements and impacts of the project. The project team was tasked with establishing a Forum; encouraging employers to use training monies to support the up-skilling of the unemployed; and to get employers to support 26 week work placements. Additionally, it matched 10 schools with business partners, and deliver a range of business/education link activities. 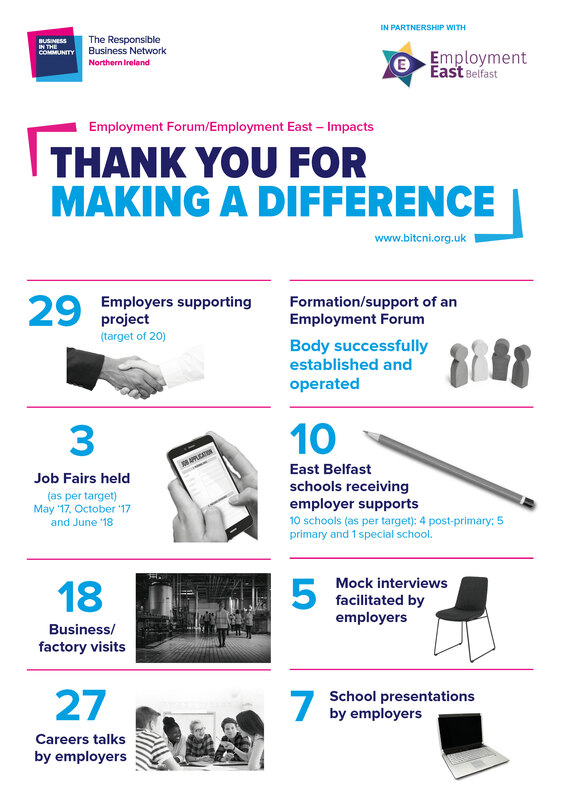 The Employment Forum/Employment East achieved 100% of its outcomes, which are detailed below.